well done Kerry please contact us to claim your prize. Gorgeous creations do snag the blinkie and wear with pride. So what's this week all about then? 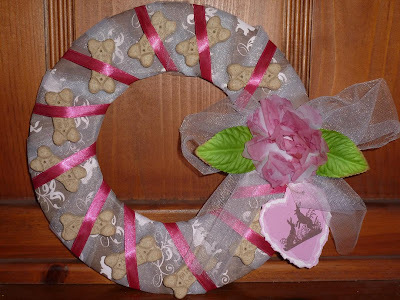 Our challenge is to use something sold at The Craft Barn - easy enough with such an amazing shop with choice galore but the twist is you must add a link to the item in the shop in your post. 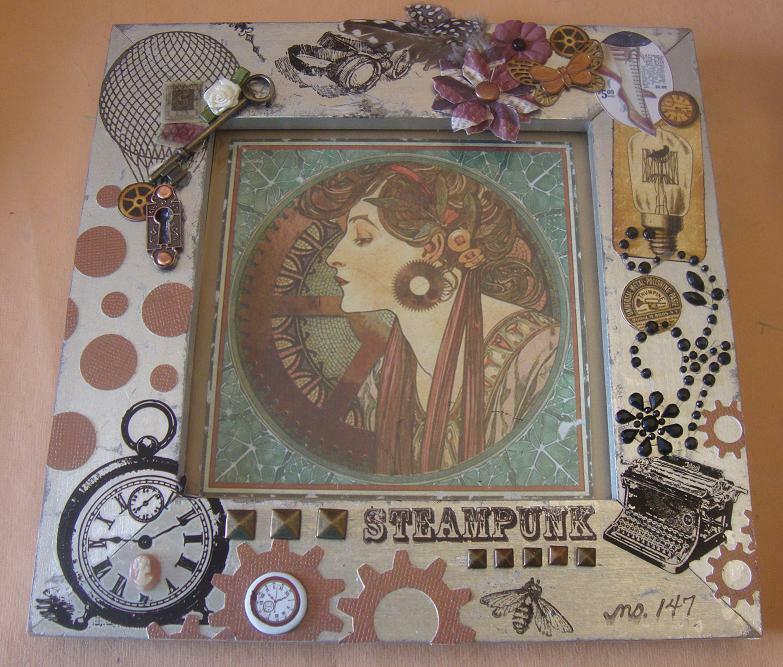 So create anything you like and with such amazing stash to choose from you will be not short of ideas. To be in with a chance of winning the Craft Barn £15 voucher you must link to the item you have used in the online shop just as our team have here. So without further ado here is the Teams creations. 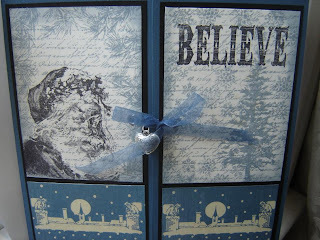 I used Gorjuss Stamp, Martha Stewart punch, twine, stickles, glossy accents and Frayed Burlap distress ink. 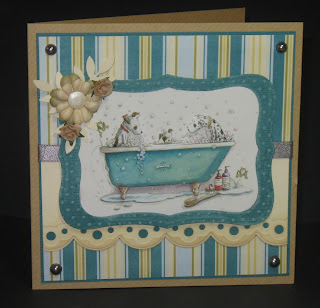 Cuttlebug with spellbinder Classic circle/Classic Scalloped cirle dies. Fabulous sample are they not? Hope you have time to play along with us - you've got to be in it to win it! Like many crafters I began crafting when I was small with a Mum and Grandma who could knit and sew encouraging me to have a go. 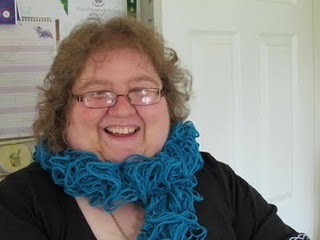 When pregnant with my first child I had to have lots of rest so I knitted my way through the pregnancy making baby coats, cardigans, hats etc and continued when the children were small. 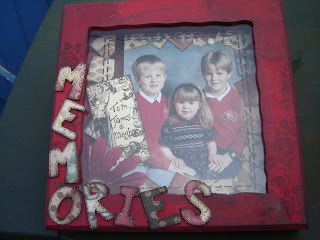 I moved onto cross stitch then when my eldest was approaching 18 decided to have a go at Scrapbooking. I got a kit from QVC and although enjoyed the scrapbooking did not enjoy using stickers and bought embelishments. 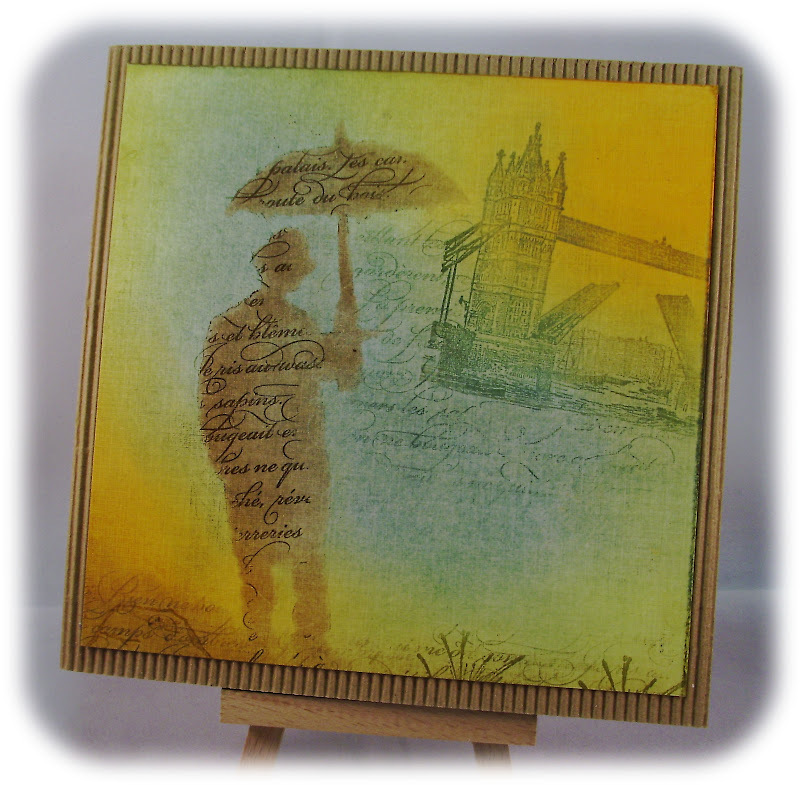 I looked around for a scrapbook class and found Art from the Heart in Harrogate. I remember ringing Ben to find out more and Dy was at CHA so he didn't know the actually project so told me to ring back the day before the crop. When I did he told me we were using paint. My heart sank I just knew it would not be my thing but I went along with my Mum and fell in love with Dys passion for Ranger products. 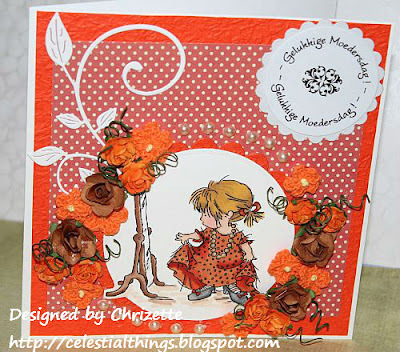 A short time later one of the crops was to make a mini book and we used Dys dotty flower to emboss with. That was it I was hooked and there began my addiction for stamping.I continued to grow in confidence under Dys tuition and my collection of Ranger products grew. When Dy moved into art journalling and stopped holding the scrapbook crops she knew how disappointed I was not to continue my scrapbooking journey so she encouraged me to start my own group in Skipton. This has now been going nearly 6 years and is still as popular although we have diversified from only scrapbooking. My love of stamping has continued and I have met many wonderfully talented crafters who give me inspiration both in person and on the internet. I still love to visit Dys for classes - she has been a massive influence on my crafting journey and her shop is a treasure trove for the stamper and altered artist. This is up in my sitting room and is a favourite piece from an Art from the Heart class. 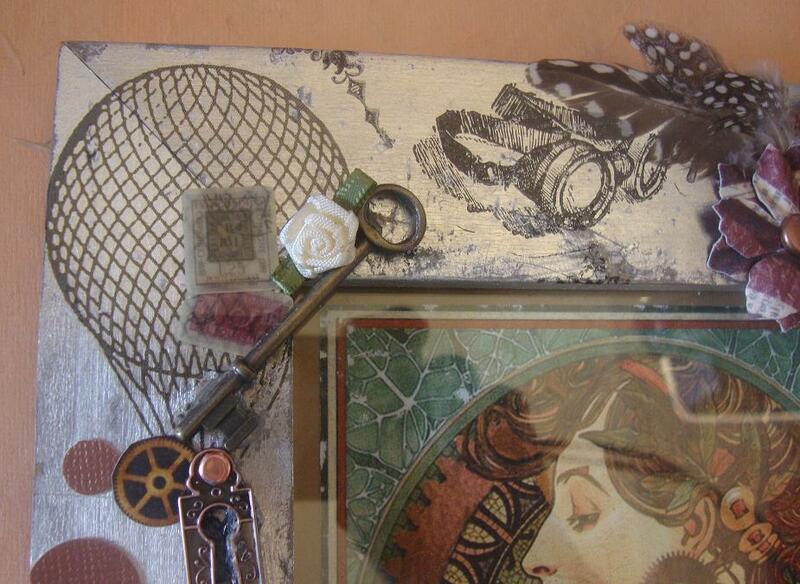 It combines my love of scrapbooking with gorgeous papers, altered art and Dys stitching. Notice the paint too! 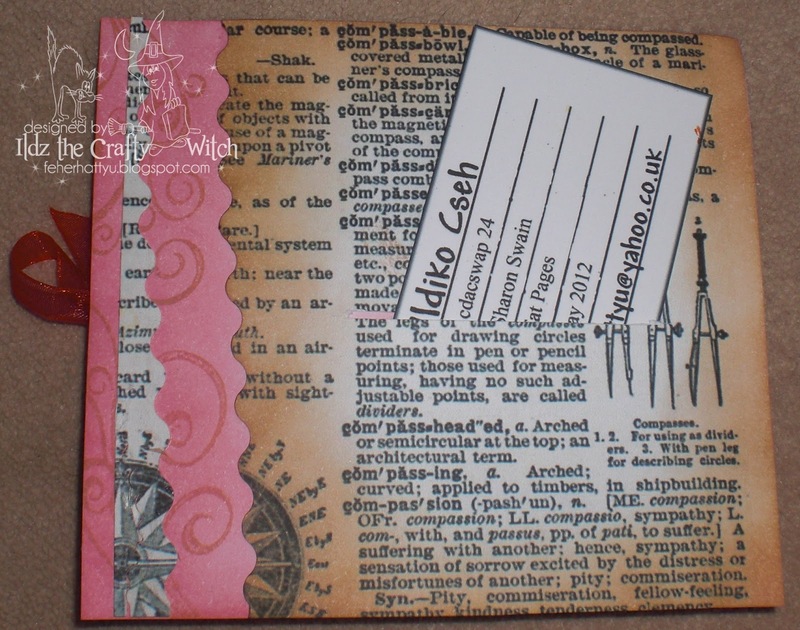 This is another favourite which again is based around scrapbooking and paint. This was made as a gift for my SIL. 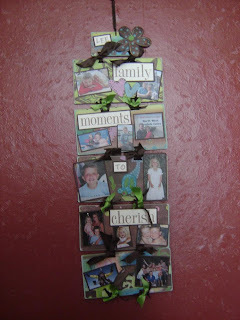 I love seeing it hanging up when we visit their home - it was fun to make and uses Blonde Moments papers which I have always loved. What is your favourite Technique ? I love layered stamping. I never thought I would get the hang of it but a Craft Stamper article by Liesbeth Fiddor really helped my on the way. 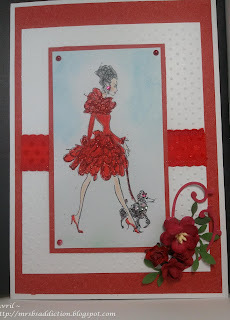 You can see my original post here but here is a few pics of projects I have loved using the technique on. Top Tip : start with light colours and work up to the darker ones. I always hear Dy telling me the background should be just that - in the background. Hope you enjoy having a look around my things and If you have any questions please leave me a message here and I will happily answer them if I can. Please do take our blinkie from the sidebar. Please email us with your info. And here is some great inspirations from the team to get you started. Now please do join us and leave a link to your project! We cannot wait to see them. Hello all! Welcome to another week here at Try it on Tuesday. 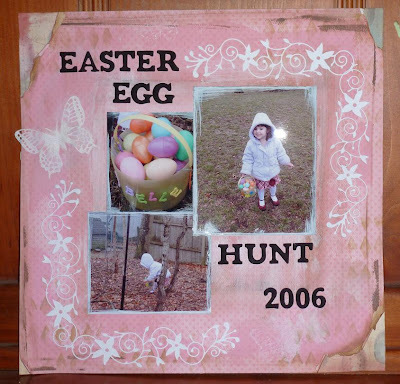 Such wonderful creations your showed us for Spring and Easter. We will be back next week with our top picks. Boy is it going to be hard to choose! But while you are waiting we have another wonderful Guest showcase for you. This week we have 3 very talented artists here with some of their favourite things. They cannot wait to meet you, So please do take a pop over to their blog and say hello! Hello, My name is Sarah Cooper, I am 36 living inOttawa, Ontario, Canada . I’ve been 'labeled' a Mixed Media Artist because if there is some way to craft it... I will: Reduce, Reuse and Redecorate is my personal mantra. Been creative my whole life, don’t think I could put a ‘date’ on when I started making 'Art'. If my Mom is right it would have been on the wall about the same time she gave me my first solid foods. 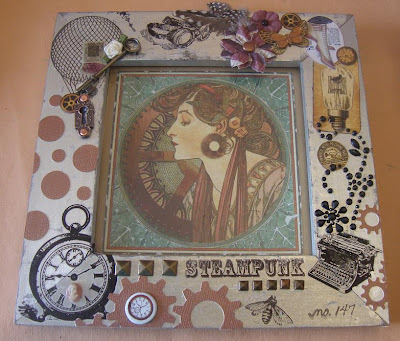 My hobbies include all things Art-sy, Steampunk, Celtic, Reading, Gardening and Canning. A lot of my favorite things are wrapped up in 'Steampunk', so that's the theme I went with. 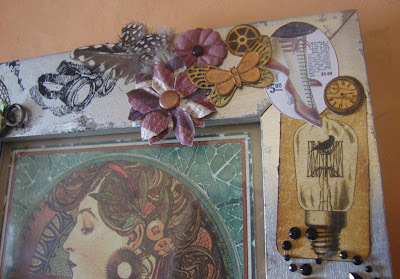 Started with a frame I pick-ed up free during a FreeCycle Give-Away Weekend. It was already painted silver, worn and battered: good start! Stamps from Stampin' Up and Rubber Cafe. 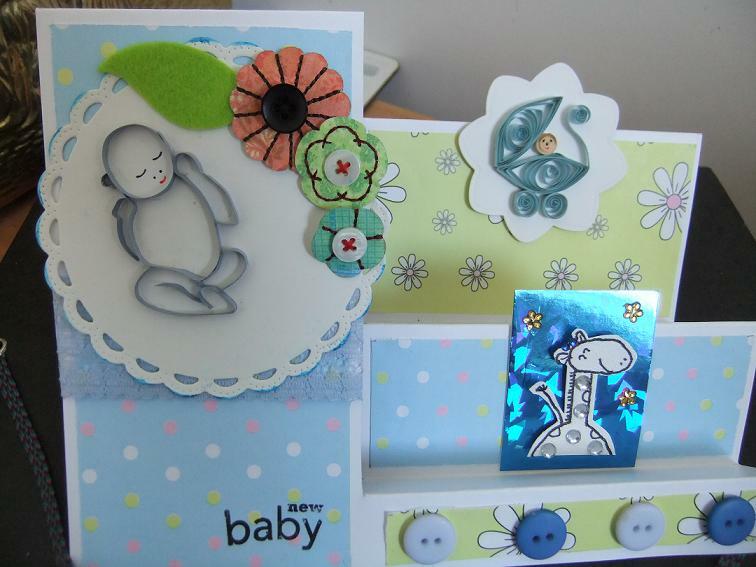 Key hole and stamp stickers from KeepSake Craft. Bling and Flowers from Prima. 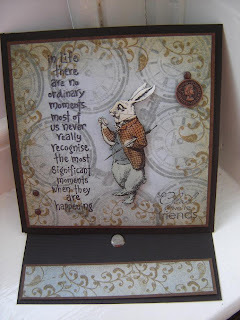 Die cuts from BoBunny and Graphic 45. Rubs on from Studio Calico and Reflections. Boot sticker from Heartwarming Vintage. 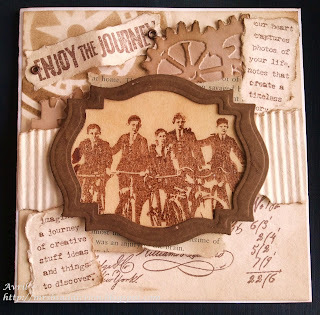 Gear Punch from Stampin' Up! My name is Chrizette and I live in the beautiful South Africa. There are so many rustic places to explore in our country and we do often - just love camping. I am married to my first love and we have been together for 15 years. We have two little Jack Russell terriers that are our children (spoiled rotten!). I have a few hobbies including beading and reading (I also review books in my spare time). 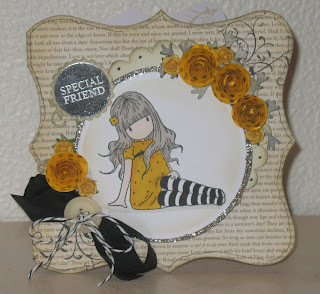 But recently I have discovered paper crafting which I adore! I am having so much fun and I just love how much I am able to learn online. The online crafting community are so friendly and sharing. My favourite area of card making, is the colouring of images with my Promarkers. I am enjoying this learning stage. Hello, I am a college lecturer in India, currently living with my husband and two kids in London. 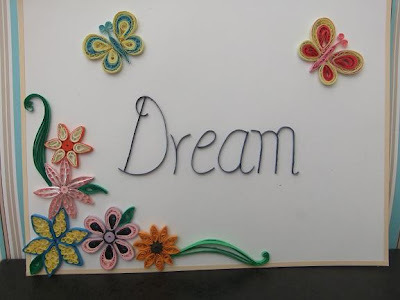 I am passionate about quilling which I learned some four years ago. 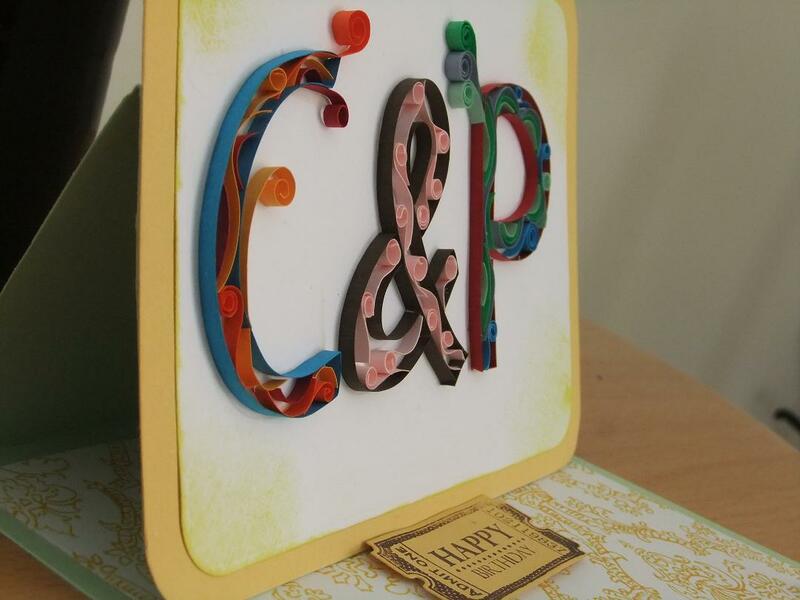 I love all kinds of papercrafts from stamping, scrapbooking, to making boxes, but Quilling remains my first love. Here are some of my favourite projects. (Quilling of course). You can visit me at my blog here. Aren't they wonderful! and all so different too. Please do pop over to their blogs and say hello!